The two-wheeled self-balancing scooter’s popularly called the “Hoverboard” is without a doubt a fun and interesting device worth having. Unfortunately, these hot toys have also attracted a few unpleasant experiences such as accidents resulting from explosions and falls. Besides, there are also complaints from buyers that they acquired poor quality boards. Since these toys are still trending, a person should know how to get genuine and safe Hoverboards. The following are 10 things you need to know before buying a Hoverboard. Before dashing off to order a Hoverboard, first consider the law in your jurisdiction. Countries like the US, UK and Australia for instance, prohibit riding of the boards on walkways and public roads. Some schools, airports and malls have also banned them. A person living in the UK might just have to be content riding the hands-free toys indoors or on their driveway. Those in the US, however, might soon enjoy riding in the public immediately the legislation allowing the riding on pathways and where bicycles pass becomes law. There have been several unfortunate incidents where the boards caught fire or exploded while being charged or ridden, and riders falling or getting involved in accidents, forcing major stores like Amazon to pull down countless brand ads from its websites. When buying, the devices find out if they comply with the safety standards such as the UN 38.3 or UL 1642 for batteries and UL 60950-1 for the charger. Also, purchase directly from the manufacturers, go through the customer reviews and ratings, wear helmets, elbow and knee caps and follow the recommended charging procedures. 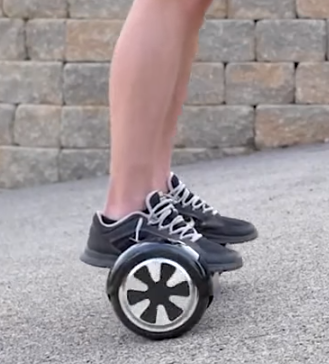 Hoverboards are either of the airwheel or board design. The board consists of two independently rotating wheels fastened on each side of the board using hinges. The rider controls it by applying pressure on the sensitive pads of the boards. The Airwheel, on the other hand, consists of one or two large wheels located at the center while the control pressure sensitive pads are on each side of the wheel. A person should determine which between the two designs appeal to him or her. The prices of the devices range from less than $300 going to slightly over $1,000 USD. The premium priced boards have superior specs and built. They offer additional features such as remote control capability, built-in Bluetooth to stream music and sturdier frames to cushion against bumps. The best bet is to determine your budget and the Hoverboard features you want and go for the toy offering those features. In case you decide to buy a low-end model, make sure it has a warranty and the backing of the retailer. Even though the average top speed range of most Hoverboards is 10mph, the speed varies depending on the model, type of wheel and the body weight of the rider. The standard board type speed, for instance, ranges between 12 to 14 miles while that of high-end boards go up to 17 miles per hour. The Airwheel type has speed ranges of about 4-6 miles and 24 to 28 miles for the low-end and premium models respectively. Hoverboards take two to three hours to charge fully, and can run up to two hours, covering a range of 10 to 12 miles on a single charge. The battery life, however, varies depending on the speed at which one goes, the surface terrain, the rider’s weight and the battery’s health. Go for a gadget that takes a relatively short time to charge and has a longer battery life. Furthermore, do not use a third-party charger, overcharge the battery or plug it in overnight, instead, follow the manufacturer recommended charging guidelines. Different Hoverboard can support various body weights up to 220 pounds or 120 kilograms. To ensure you do not strain the board and wear it out too quickly consider getting a board that can carry more than your total body weight, or the weight of the rider. If you weigh over a hundred kgs, then the 10in Hoverboards are the ideal option. However if you weigh below that your board options deeps up to the 7 inches boards. Due to the numerous complaint about inferior and life-threatening incidents, it is prudent to consider where you buy the Hoverboard. Always buy directly from the manufacturer or their certified authorized agents. Besides, observe due diligence and verify the supplier by asking for references, going over customer reviews and ratings and confirming they satisfy the safety and quality standards. Last but not least find out if the supplier offers any warranties or support in case of problems arising with the device. Since the riding of the Hoverboard is illegal in many places, you might have to carry the board frequently to get to the open areas. It is, therefore, prudent if you bought equipment that is not too heavy or bulky. Fortunately, the boards are of varying weights ranging from 18 to 30 pounds. All one has to do is select the one they find convenient. Hoverboards come in different wheel sizes with the 6.5-7 in, 8.in and 10in being common. Each of these sizes offers unique benefits, for instance, the smaller sized 6.5-7in wheels provide more efficiency and is ideal for smooth paths. The 8in has more stability and is perfect for uneven roads. When it comes to rougher off-road terrain such as on grass, uneven or slightly rough surfaces the 10in wheel becomes the darling of the crowd.